The Peugeot 807 is a people carrier in every sense of the word. It provides excellent passenger space and high levels of comfort even on longer trips. The 807 comes well-equipped and is safe.The car’s cabin is well thought out and cleverly designed. The car’s switchgear is logically placed and functional. The gearlever is mounted on the dash and is easy to find and operate. The car’s cabin provides good levels of refinement. Engine and road noise are well suppressed. The car’s seats are comfortable and supportive, and the many creature comforts help to enhance the overall feel of the cabin. The 2.2 diesel engine is the best choice for power, performance and economy. The 2.2 delivers a more quiet and economical ride while supplying plenty of power. The other choices are adequate but the 2.2 is by far the best. The car’s seats can be rearranged or removed for added versatility. 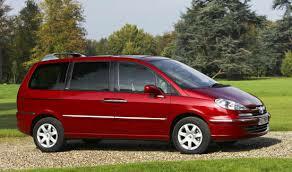 Removing the rear seats creates more cargo space and the Peugeot 807 is capable of carrying very large items. The seats can be difficult to remove, and that’s pretty common among cars in this class. The Peugeot is a bargain buy. The 807 is inexpensive to purchase and run. The diesel engine option helps to keep fuel economy low. Insurance and running costs will be low as well. The 807 provides good value for money. The cabin provides good passenger and cargo space. Head and legroom are good all-round. Rear seats should be reserved for children due to less space in the rearmost seats. The seats can be removed in order to create better cargo space. The car’s controls and dials are logically placed and where you would expect them to be. The gearlever has cleverly been mounted on the dash for ease of use. The switchgear feels sturdy. The cabin provides good levels of comfort. The seats are comfortable and supportive and road and engine noise are kept to a minimum. The car provides a smooth and enjoyable ride. The 807 provides excellent accessibility, especially for the front and middle passengers. The rearmost row of seats is more limited space-wise and should be reserved strictly for children whenever possible. The 807 provides a good driving position. Visibility is also good all-round, making parking much easier. The car’s steering is light at low speeds and the car is easy to maneuver. It may take some practice getting used to the vehicle’s large size. The 807 was not designed for performance or speed. It was designed to carry people in a reasonable amount of comfort, and that it does very well. The 807 doesn’t deliver much in the way of driver appeal. This is an excellent family vehicle. It provides adequate seating and good passenger space. The boot is a reasonable size as well. The car is durable enough to withstand the rigors of family life. The 807 would not make a good first car. It is way too big and will be much more car than what most first time buyers need. The 807 also embodies very few features that younger drivers would find appealing. Peugeot makes a wide range of vehicles. The quality of the car’s build and materials that are being used has steadily been improving. Peugeot offers affordable prices on practical vehicles. The car’s basic security features include auto closing sunroof and windows, automatic door lock after 30 seconds, automatic tailgate locking over 6mph, coded in car entertainment, deadlocks, a multi-function high frequency Plip key, remote central locking for doors, fuel cap and tailgate, immoboliser and visible VIN number and a lockable glove box. The car’s standard safety features include electrically operated child locks on rear doors, front and rear curtain airbags, front and rear door side impact beams, front side airbags, 3 point seatbelts on all seats, fuel cut off switch and smart driver/front passenger airbags. The car’s standard audio unit consists of radio/CD player. The system is functional and easy to use. The unit boasts good sound quality. The basic controls have been duplicated on the car’s steering-wheel for driver convenience. The car’s interior also includes two upper dash storage compartments, second row storage area, cloth trim, height/reach adjust steering wheel and an under dash storage area below steering wheel. The 807 is a well-equipped MPV. The 807 will face steep competition in this sector but doesn’t seem to mind. The Peugeot is priced higher than other Peugeots but may have a hard time against bigger names. The car offers loads of practicality and a good deal of versatility as well. Families will love the possibilities that the 807 brings.